This is my New York Beauty tutorial and the final stop on the quilt along! I am going to teach you how to make Block 9, so let's get started. First, print off the free pattern. You'll print one copy to make one quadrant, or four copies to make the full circle. Since I didn't make the full circle, I am going to use the magic of technology to show you what it would look like. Do you see how the dark gray and light purple triangles should match but they don't? This is because you'll want to choose the same color fabric for your first and last triangles, but I didn't think about this. When you select your fabrics, please keep this in mind! Print on computer paper and cut out all of your pattern pieces, leaving the 1/4" printed border for your seam allowance. I left a little bit extra just because, but you will trim this off in the final stages. Choose your fabrics for the pieced arc. Take your fabric for section 1 (white), and hold the fabric on the back side of your printed pattern. Hold up to a window and make sure you have at least 1/4" on each side of the printed section 1. Hold or pin in place. Now take your fabric for section 2 (light gray) and place it on the back of your paper just like you did with the white. Align fabric so that both the white and the purple are 1/4" over the line between sections 1 and 2. Pin along the line and fold back purple to make sure it completely covers section two when folded open. Stitch along the line between sections 1 and 2 to secure both pieces of fabric in place. I am using a contrasting thread so you can see my stitch line. On the back side of your paper, check out your seam and trim seam allowance to 1/4". Open up the seam and use a glue stick to adhere purple fabric to the paper. You may wish to skip this step later on, but I think it's helpful in the early stages of your arc. Next, choose your fabric for section 3 (I chose Alexander Henry Heath in pink). Again, hold it up to a window and place fabric so that it lies 1/4" outside the seam line between sections 2 and 3. The right side of your fabric should face the back of the paper, so that when folded open, the right side of the fabric is visible and completely covers section 3. Stitch the line between sections 2 and 3, and use your scissors to trim a 1/4" seam allowance. Here is is, freshly trimmed. Fold over the pink fabric. Here's what it looks like folded open. Note: Notice that my pink does not completely cover the top edge of the seam allowance, and my light purple does not completely cover the bottom edge of my seam allowance. For the pink, I used my glue stick to stretch the fabric in place, so it would cover the seam allowance. For the purple, the missing section is so slight that it will be concealed in the seam allowance when I join the block to another, so I didn't worry about it. But these are errors you should look out for, especially when working with small scraps. Better too much fabric than not enough! It's time for more white! Here are a couple photos of how I fold the fabric back while holding in place, to make sure the fabric will completely cover section 4 when folded back. Stitch along the line between sections 3 and 4. Fold back the fabric from the paper and trim 1/4" from stitch line. It's time to add your next color (aqua). Use your window again to place the fabric for section 5. See how it is at least 1/4" below the stitch line between sections 4 and 5? Stitch along the line between sections 4 and 5, trim fabric 1/4" from seam (or thinner as I did here), and fold open the aqua fabric. Can you guess what comes next? It's the pink again, so I'm going to use my window to align the pink fabric so it is at least 1/4" below the stitch line between sections 5 and 6. A reminder that your new fabric should always completely cover the next section (in this case, 6) when opened up. Continue piecing your triangles until you have something that looks like this. Here's the front. Here's the back. Essentially, you are creating a reverse image on the back side of your paper. Use your rotary cutter and ruler (or paper scissors if you have them) to trim around your pattern. Make sure you leave the 1/4" seam allowance in place. Now with your pieced section complete, cut out fabric for the inner ring and center arc. I chose a pink print for the ring and white for the center arc. Fold the inner ring and center arc in half to mark the center line, and pin with right sides together along center. Next, pin the left and right sides together (not pictured). I like to use as few pins as a I can get away with, but you'll want to use as many pins as you need to sew around the arc without creating bumps. Stitch in place with a 1/4" seam allowance. Here is the what you should see. Now it's time to attach the outer border. To make your background continuous (instead of two pieced halves), fold back or cut the edges of your arc, and use a glue stick or tape to attach both sides along seam allowance. This will become your new template. You can start to peel away the paper backing or leave in place, whichever you prefer. I peeled my paper away for this step. Cut out your background template, and fold in half to mark the center line. Pin in place with right sides together along center line. Pin left and right sides of both pieces together. Add pins as needed to smooth out curve. With background side on top, stitch together 1/4" from edge. Use your fingers to smooth out the curve make sure you don't introduce any wrinkles as you sew. Press and trim block, and repeat as desired! Another reminder, that you'll want to make sure your first and last triangles match if you want to create a continuous circle out of four pieced blocks. And that's a wrap for the New York Beauty Quilt Along! Did you miss some stops along the way? Click this button for links to each of the tutorials. Oooh, love this one! And your color choices are perfect! Gorgeous! 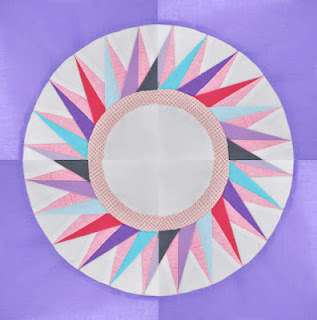 I love that you have those 4 darker, shorter purple triangles - it looks like North, East, South & West on a compass and adds an extra dimension to the pattern. I'm going to use a different color for these triangles when I make this block. Thanks for the great tutorial! wonderful tutorial. these are tricky, but they always turn out wonderful! can't wait to see them all put together. Love the purples!! The subtle grey point! What is the name of the lavender fabric in the upper left of this block? It's just the shade I've been looking for. Thanks for the tutorial. Beautiful block! links to the pattern come back with a 500 error code - is the pattern no longer available? Great tutorial. Like you use scissors to reduce the seam allowances. I always cut the same way not by rotary cutter thinking there is no need to have a perfect quarter inch seam allowance. Thanks for sharing. Wonderful tutorial. Will enjoy trying this in 2016! Merry Christmas from Nova Scotia.